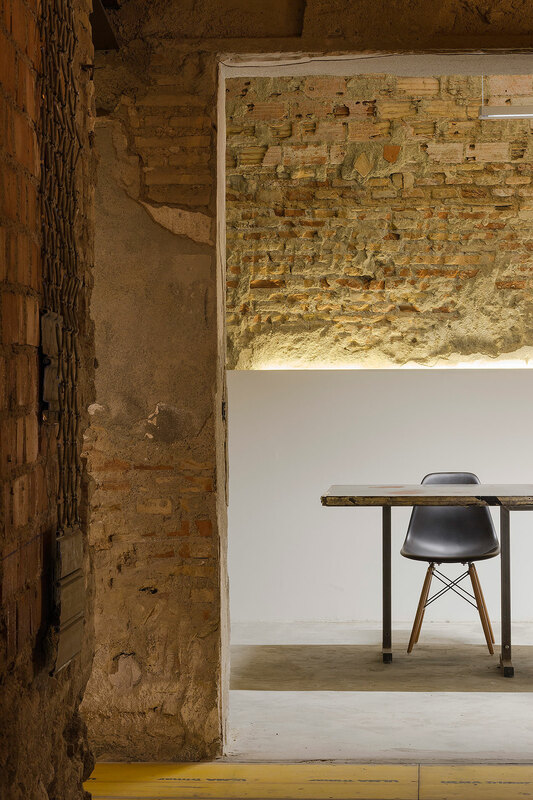 The studio office space of San Jeronimo 17 in Granada, Spain, is an amalgam of old and new, the historical and modernity alike. 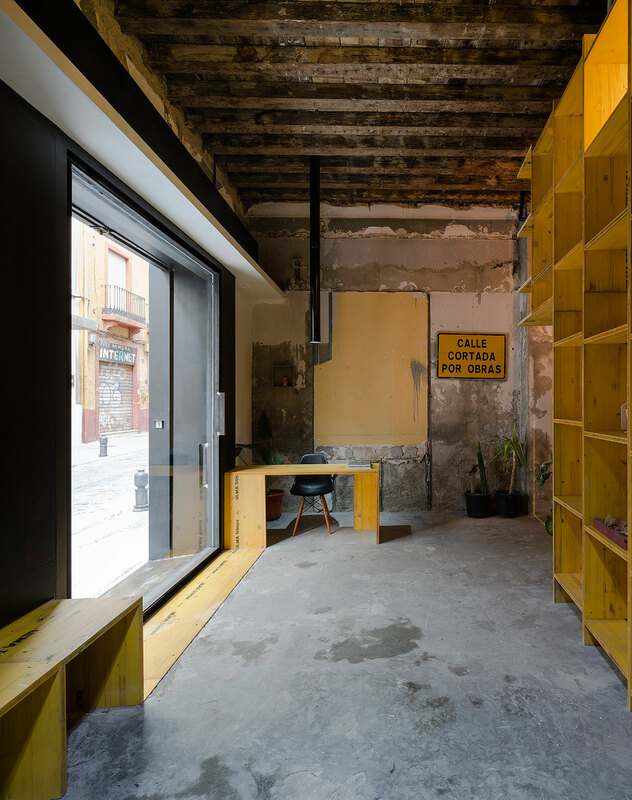 Completed in December 2015 by CUAC Arquitectura under the supervision of architect, Álvaro Castellano Pulido, the 146 square meter space unfolds a multiplicity of references and their implementations right from the first step through its doorway in the city's historic center. 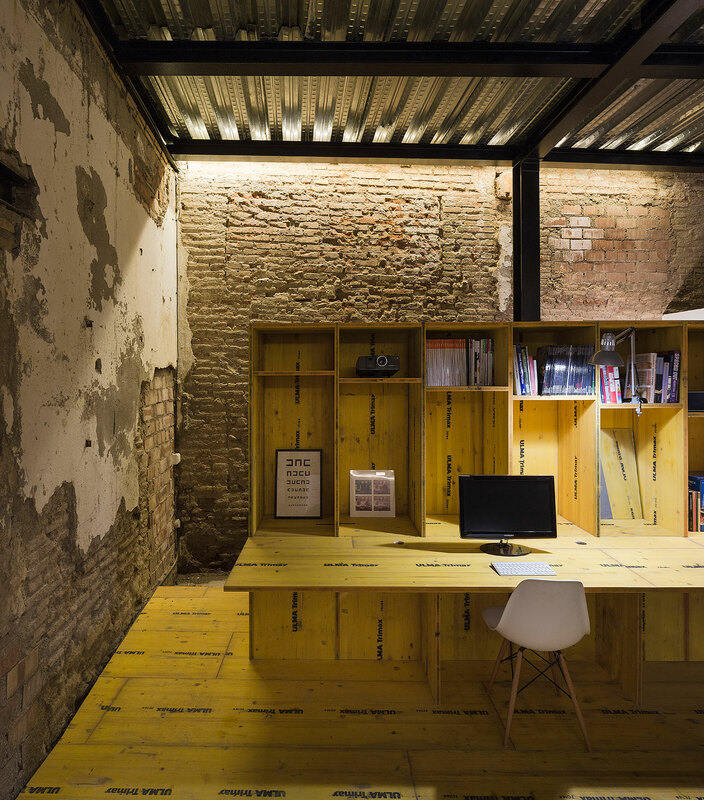 The building that houses the office was originally constructed in the late nineteenth century: Hence, the new studio features the building's original wood floors as well as the 60 cm thick brick walls, both of which add the strength of substance to the overall design scheme as well as set the conceptual tone. 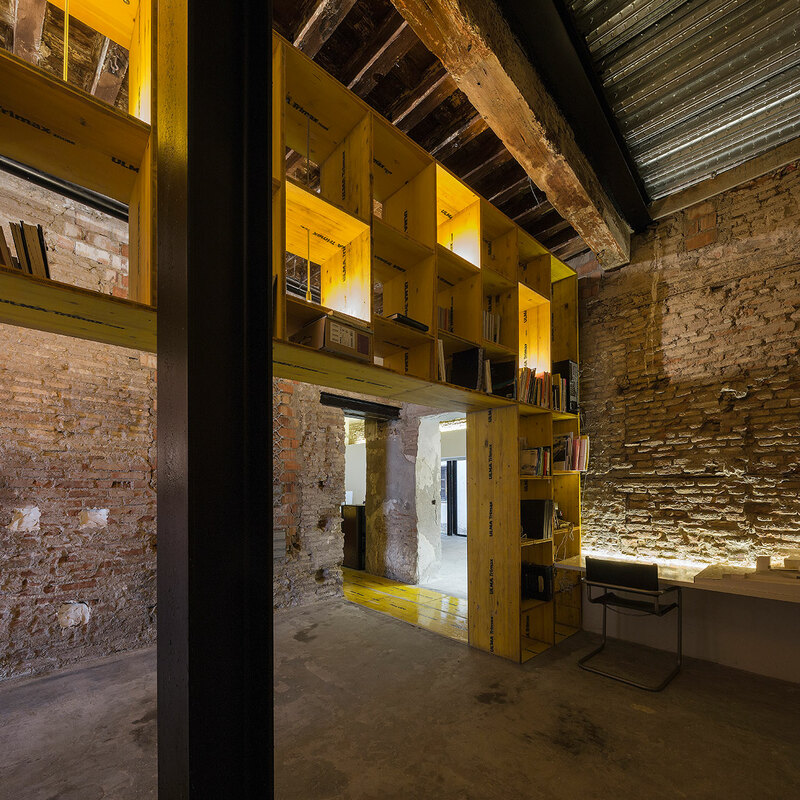 The walls are stripped bare allowing the brickwork to shine through the crumbling plaster which is then juxtaposed by the ceilings; in some spots, the original wood beams are clearly visible - oftentimes stoically sagging under the weight of their own age - whereas in other places a newer, metal ceiling has been utilized, braced up against metal supporting beams. 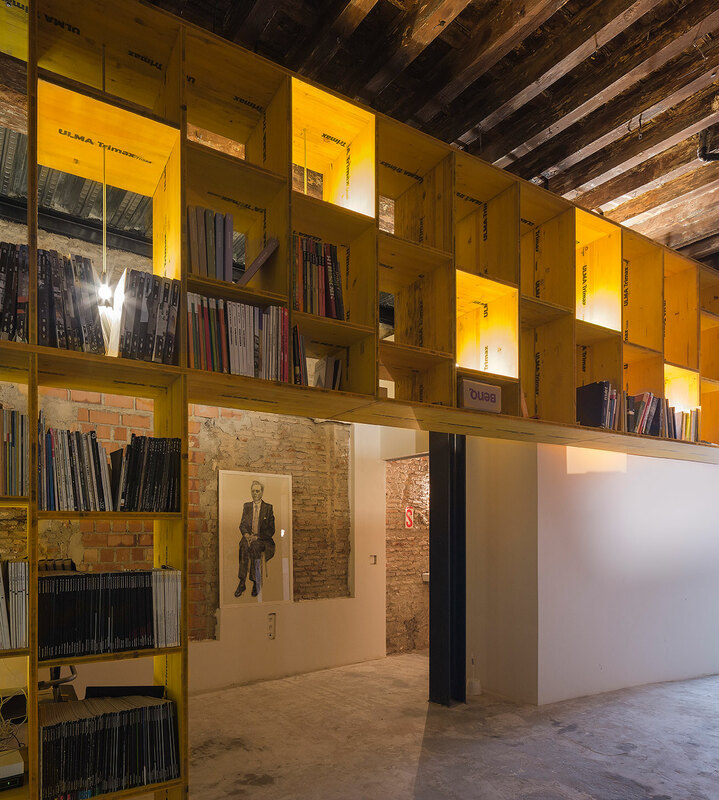 Asides from the structure exemplifying how the patina of age has been embraced, the architects also sourced some very special elements which they utilized in this studio's redesign. 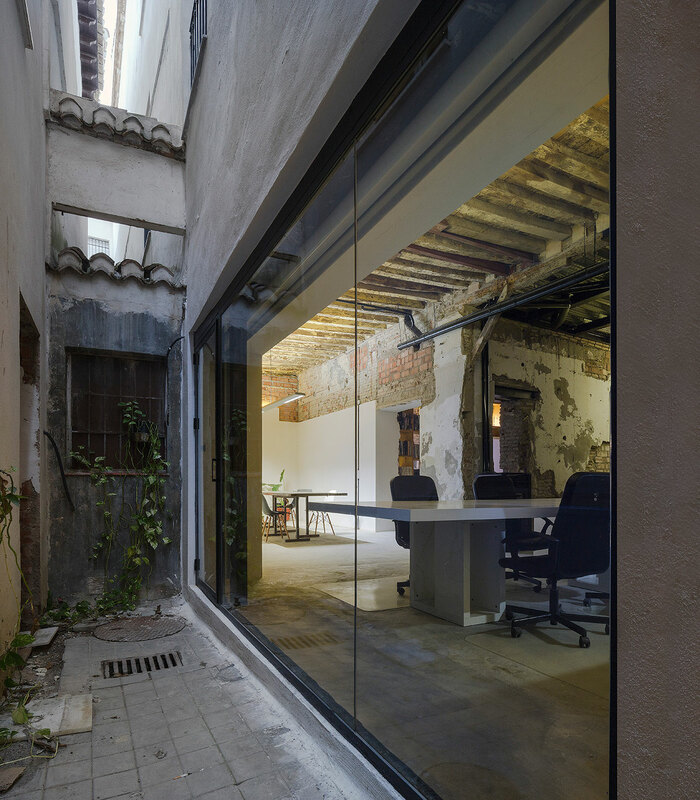 Namely, six wood doors, a few metal shutters and many old sheets of glass which have been repurposed and used throughout San Jeronimo 17. Meanwhile, an old music school was the place of origin for a vast collection of old wood shutters. 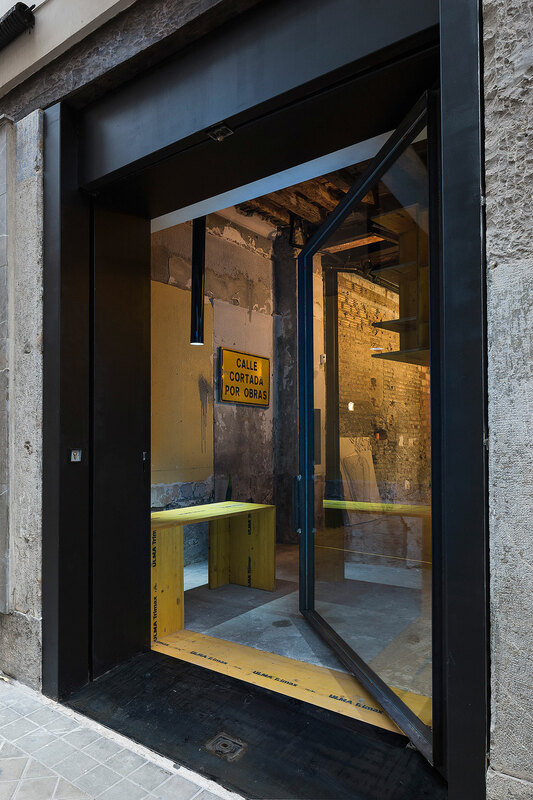 Painted yellow, these shutters have been transformed into a network of cabinets that stretch throughout the space and now lend themselves as the "infrastructure" of the studio, storing everything from books and cables, having been built into desks and shelves, and dividing the office space into smaller compartments. 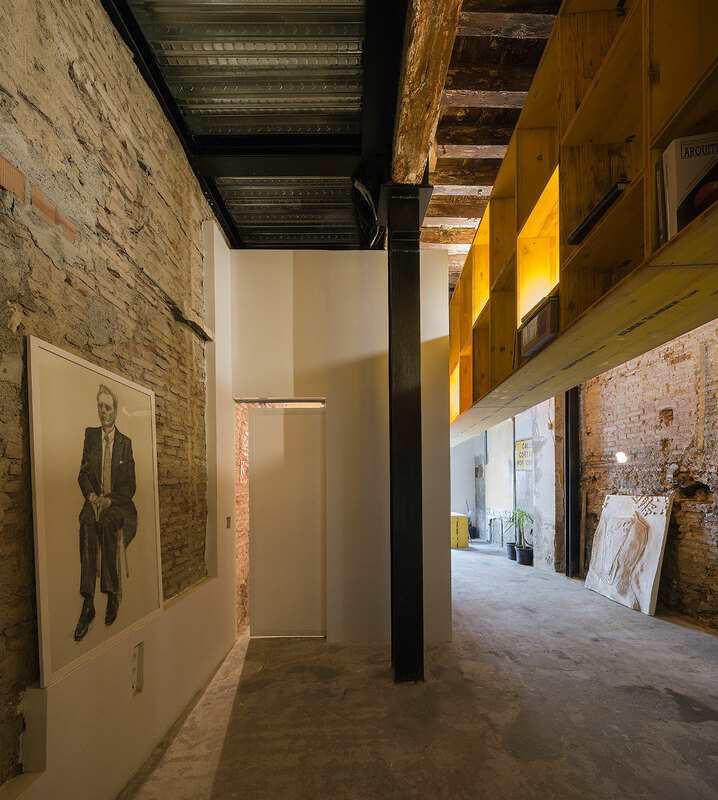 The studio's own history has also been taken into account via the designers of CUAC Arquitectura repurposing a four meter tall by one meter wide door from their client's old studio space, and using it as a cornerstone in San Jeronimo 17's design. 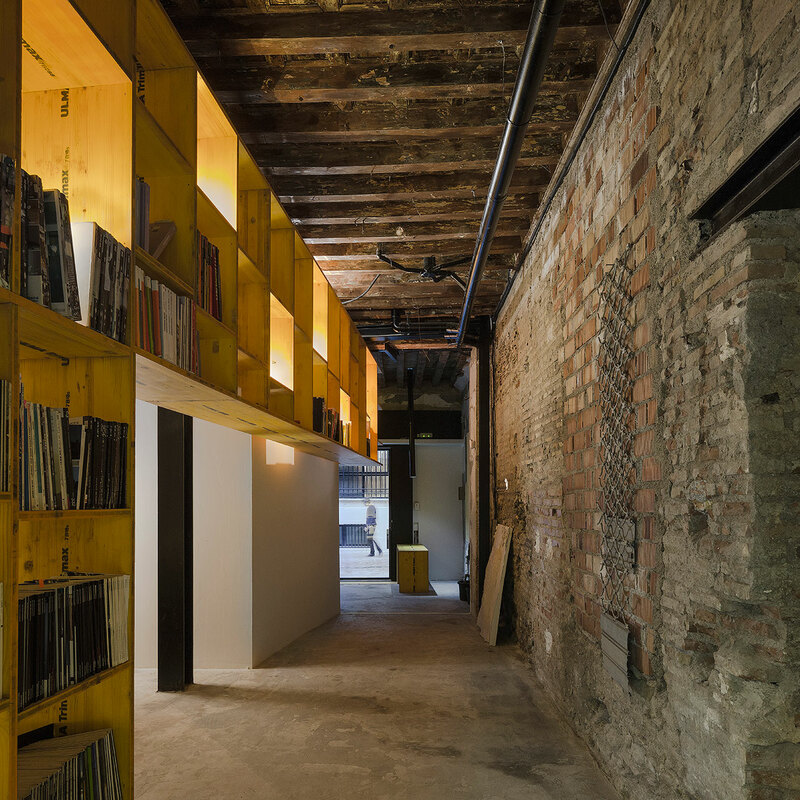 The space however isn't only shaped by its past or the past of its accoutrements. 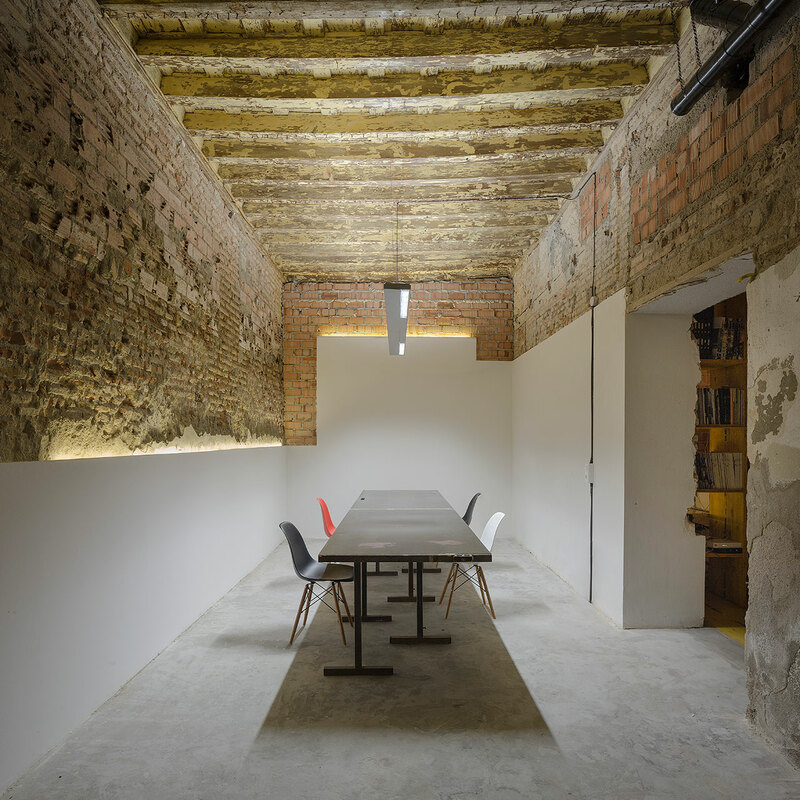 For instance, the conference room boasts a modern minimal, long table and its walls are smoothly whitewashed halfway up to the ceiling so as to incorporate the gritty, exposed brickwork and old wood ceiling beams into the mix. 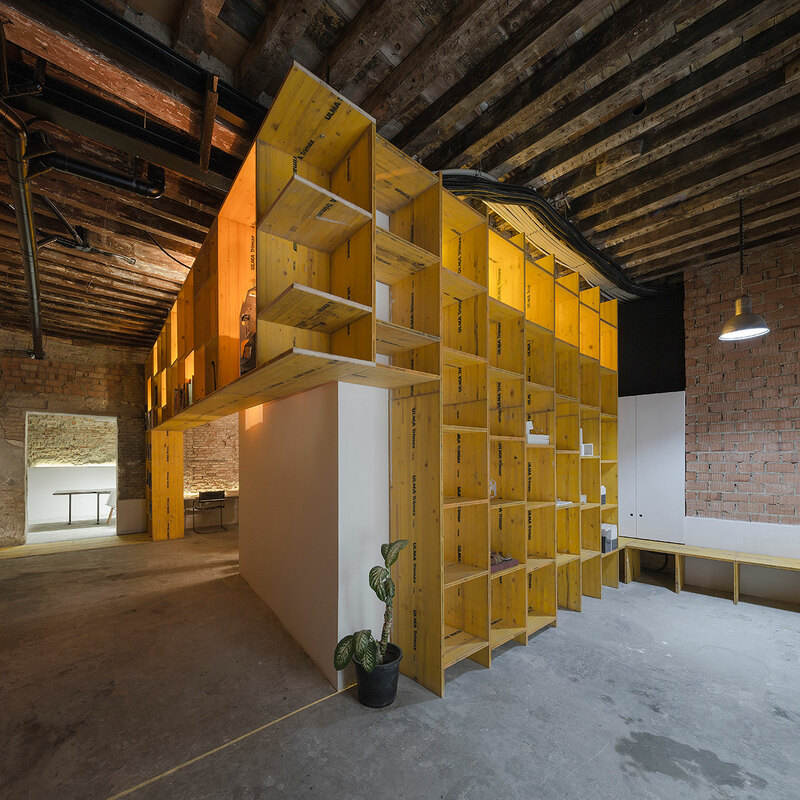 Perfectly exemplifying most of the studio space, this room highlights both the old and the new, synchronizing them to dynamic effect.